34" cylinder, 34" stroke engine, Thomas Wilson Iron Works, Dundas, ONT; 11'6" x 10'9", 78# steam scotch boiler. 1873, May 7 Launched; cost $30,000. 1874 Montreal & Chicago Line. 1879 Owned Hume & Co., Toronto, ONT. 1880, Oct 14 Disabled near False Duck Islands, Lake Ontario. 1881-1881-1883 Rebuilt & lengthened Muir Bros. Pt. Dalhousie, ONT. 172 x 23.1 x 11'; 925 gross tons/594 net tons; owned Haggarty & Hume, Hamilton, Ontario. Merchant Line, Montreal to Chicago. 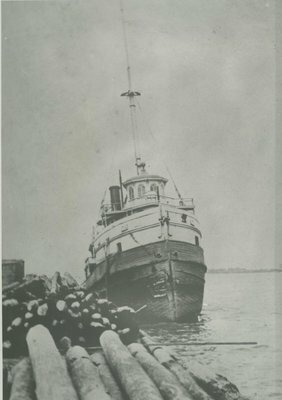 1896 Owned Calvin Co., Garden Island; rebuilt as steambarge for timber trade. 172 x 25 x 12'; 643 gross tons/403 net tons. 1901 Owned David Dean, Richards Landing, ONT. 1905 Owned R. J. Gaskin 176.2' x 25' x 11.5'; 467 gross tons/318 net tons. 1907 Owned A. C. Waud, Montreal.